These Halloween cupcakes will set an arachnophobes heart a flutter! 1. Bake cupcakes according to instructions in regular muffin cups. Let cool. 2. While cupcakes are cooling, prepare the frosting. Divide into two bowls. One for the base color (green) and one for the web color (black). Place black frosting in decorating bag fit with writing tip. 3. Frost the top of the cupcake with the green frosting using a pastry bag and tip of your choosing. Then carefully pipe web design onto each cupcake using decorating bag with small writing tip using the black frosting. 4. Affix Hunchback Spider Picks to cupcakes by gently pushing into the frosting. 5. Assemble cupcake wrappers by fitting the tabs together and securing with tape. 6. Carefully put each cupcake in a wrapper and serve. Learn how to make these super easy spider web cookies with spooky sugar spider decorations! Image & recipe thanks to Lucks.com. 1. Make your favorite cookie recipe and let cool; alternately, you may use pre-made cookies. 2. Tint icing orange using a few drops of Orange Food Color. 4. Use fudge or ganache in a round tip to pipe a chocolate spiral on each iced cookie. 5. Before icing crusts, use a toothpick to drag lines through icing as shown, to create a webbing affect. TIP: Begin from the center of the cookie and pull toothpick outward. 6. Attach Spider Assortment decorations to each cookie. 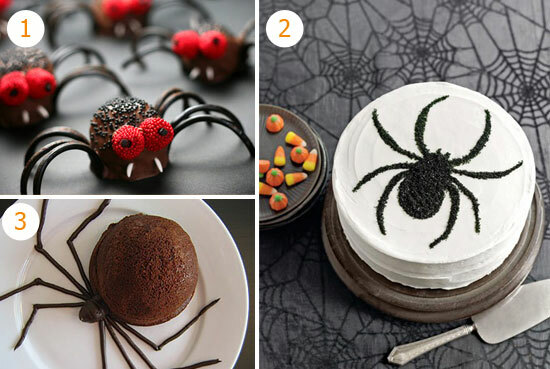 Make an easy Halloween cake with creepy Large 3D Spider Decorations! 1. Bake cake according to instructions. Let cool. 2. While cake is cooling, prepare the frosting. Divide into two bowls. One for the base color (yellow) and one for the web color (orange). Place orange frosting in decorating bag fit with writing tip. 3. Frost the cake with the yellow frosting using a pastry bag and tip of your choosing. Then carefully pipe web design onto cake using decorating bag with small writing tip using the orange frosting. 4. Affix Spider Decorations to cake by gently pushing into the frosting. This entry was posted in Halloween Baking and tagged Halloween, halloween cookies, halloween cupcakes, spider cookies, spider cupcakes by Fancy Flours. Bookmark the permalink.